The Friends of the Huron Mountains (FOHM) has released a sight analysis of the proposed Summit Lake Wind Project (SLWP) in Baraga County developed with help from the Geospatial Research Facility at the Great Lakes Research Center of Michigan Technological University. The “view shed,” available as both a two-dimensional map as well as in virtual reality, shows how turbines at the SLWP site would be visible from locations within a 25-mile radius, surrounding Keweenaw Bay and as far as Quincy Hill in Houghton County. FOHM opposes the SLWP and led the push to establish a referendum in L’Anse Township on zoning changes for the project, which was proposed by Renewable Energy Systems (RES) on Weyerhaeuser-owned property. At an informational meeting in July, RES displayed several photos that it said were representative of the views from around Keweenaw Bay at the request of several citizens. “They kind of cherry-picked them,” FOHM Chairman Burt Mason said. According to a press release from FOHM, member Bob Kissel proposed the sight analysis to test RES’s assertion the turbines would not be widely visible. “We’re pretty proud of it,” Mason said. Mason declined to disclose the cost of the analysis. The map was created using Department of Agriculture geological survey map information, which uses light detection and ranging (LiDAR) to obtain precise measurements of elevation and includes ground cover information to take tree cover into account. Bright orange areas on the map are where the nacelles of the turbines — the nacelle is the center of the turbine, where the blades meet — would be visible regardless of time of year. The duller orange areas are where nacelles might only be visible in the fall or winter when the leaves have fallen, or if trees were cut down entirely. The view was calculated with a view six feet off the ground. navigation warning lights would be located,” Mason said in a press release. The blades would extend more than 200 feet out from the nacelle, according to information from RES, but their exact position would change with wind direction. The virtual reality views do not include forested calculations because the computer processing power to render those views exceeds that of many home computers, Mason said. “It was going to take a supercomputer,” he said. Instead, he recommended using the map in conjunction with the virtual reality viewer. The viewer can be placed in any location on the map, and panned around like a camera viewfinder. 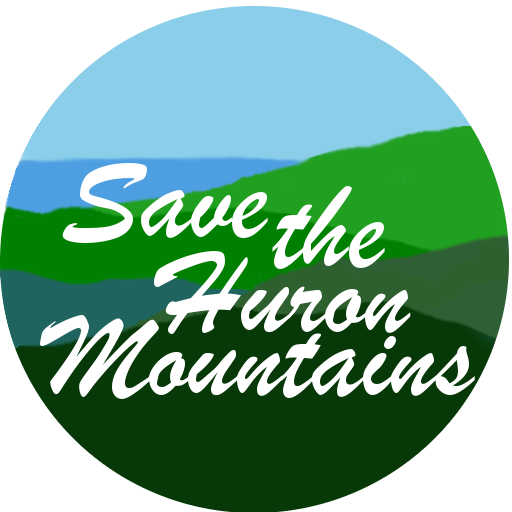 The map, viewer and directions for their use are available at savethehuronmountains.org. FOHM is also planning on displaying large-print versions at future informational meetings leading up to the May 7 referendum. Map Image: Provided by the Friends of the Huron Mountains The map released Wednesday by the Friends of the Huron Mountains shows where and how many proposed wind turbines would be visible from locations in a 25-mile radius of the proposed wind farm site.